One thing’s for sure; duffle bags are convenient to use but also get dirty easily. They are widely used because they cost less than suitcases but are also more compact. They’re great for on-the-go people and are easy to store away. Still, most duffle bags are porous. Trapping odors and dirt, a pack like this takes some time to clean. Another reason for this is that a duffle isn’t as sturdy as a suitcase. Which means it’s often tumbled and thrown around. If you own a pack like this, you probably love it for its compactness and portability. But I’m sure you’ve noticed its dirty and smelly downside. Soaking your pack in water isn’t a good idea simply because it’s no way to clean it. Soaking it in water won’t take out any stains and dirt. Focus on actually cleaning the fabric. Though it would be the easiest way, washing your sack in a washing machine is a bad idea. Some polyester duffles can handle machine-washing, but only on a gentle cycle. You should never wash a canvas pack in a washing machine either because most canvas ones have some kind of waterproof treatment to it and could be compromised if washed in a machine. The fabric could also wrinkle beyond repair. Is there a big stain? Since you’re already going to put time and effort into it, you might as well clean the whole pack. As I said, these items get dirty quite easily, so there are probably other stains you didn’t notice. Plus, why wouldn’t you freshen it up a bit as opposed to just cleaning the obvious stain? Flip your item inside out and shake off all the pieces of dirt inside. Most of the time, the inside of your pack contains dust, dirt, pieces of paper, and all kinds of mess it has collected through your journeys. Emptying it to the best of your ability so cleaning is easier to do. Remember to empty all the side pockets, too. Ballistic nylon – use antibacterial soap and a sponge to clean this type of pack. In most cases, duffles made of ballistic nylon repel odor and dirt on their own, so you should only wipe it down a bit. Make sure to avoid all chemical-based cleansers because those can easily damage the material. Canvas – simply wash the inside of the bag with soap and water as this should get most of the dirt out. Still, if some stains remain, spot-clean them with laundry detergent. All bags have some type of hardware, or at least zippers. These, of course, need a little extra attention. After you clean your bag, make sure to blow dry the hardware. Letting it air dry on its own can lead to rust and possible discoloration. Even when clean, duffle bags tend to smell funny, especially those made of nylon. To eliminate this, spray the inside with an air freshener of your choice. Again, don’t use anything that has any harsh chemicals in it. Chemical fragrance will most certainly damage the fabric. The resistance properties of polyester and nylon usually wear off over time. What you can do is spray the bag with solutions that strengthen those properties. For canvas, choose protection sprays such as Scotch Guard to protect the fabric from future odors and stains. These are a few tips and tricks on how to clean your duffle bag. 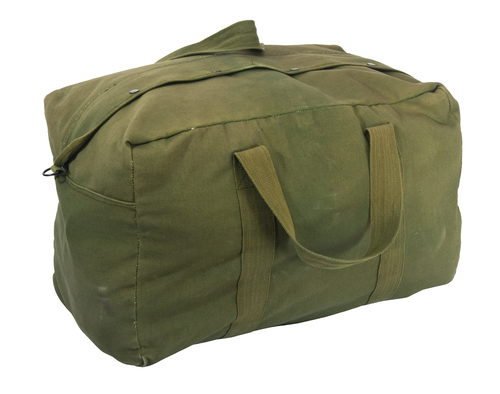 A quality duffle bag is durable but will last you even longer if you take good care of it. Washing it incorrectly can dramatically shorten its life. However, there are many different duffles on the market, and some require a special type of cleaning. I suggest you always check the inside tag or label that usually contains cleaning and drying instructions.